For some people, it is a most to have their own office space. This way, they are able to work in a private space without interfering with the activities of the home and isolating it from any noise or disturbance. There are also some who have their own business and prefers to work in their home instead of acquiring another space as an office. If this is the case, the home office should be designed really well. Aside from considering clients and guests that will come to the office, we should also think of creating a good working environment in order to be more productive. With this in mind, we would grab the perfect furnishings that will fit to our space. But we would also look into decorating them with stuffs we love. Of course, the walls could be highlighted too by covering it with interesting designs of wallpapers. And you will see this in 20 different home offices that we have collated for this post. 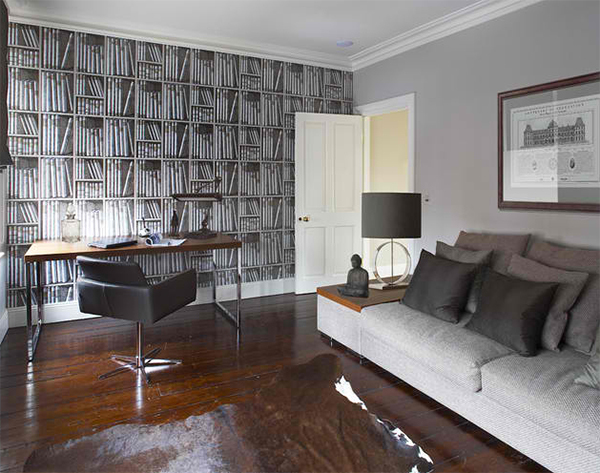 Sure, even this space for a man could use manly wallpaper too just like the Fornasetti Ex Libris Wallpaper used here. Uplift your energy to work with a damask wallpaper of your favorite color. 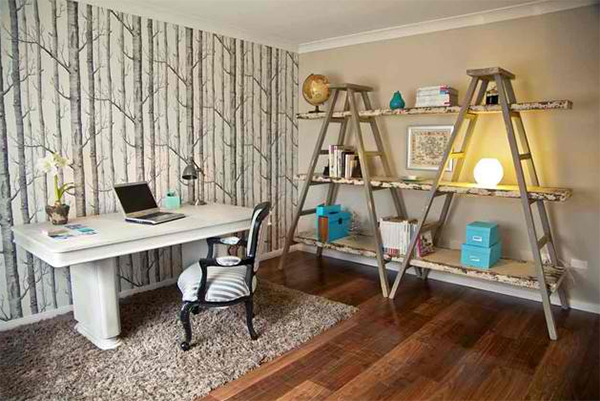 Cute patterns are used in this home office and it sure looked very modern with that approach. The wallpaper is a charmer! 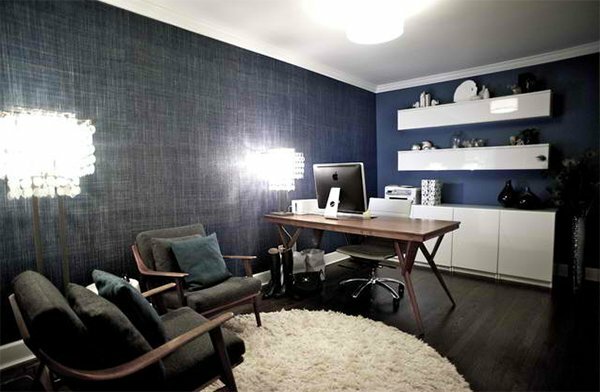 A small home office doesn’t have to be boring. Add a wallpaper and voila, everything turns really gorgeous! 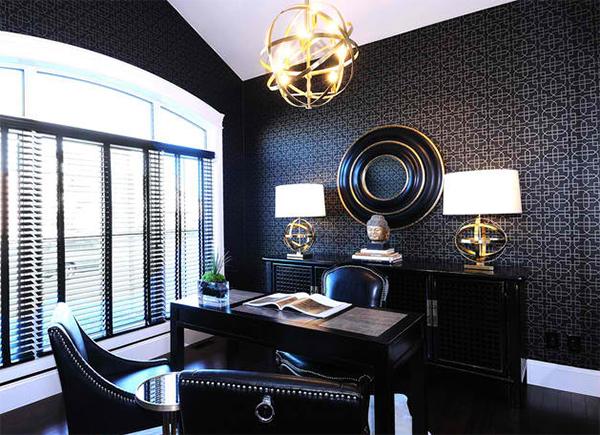 The timeless beauty of black is reflected in this elegant home office with gold and silver accents. 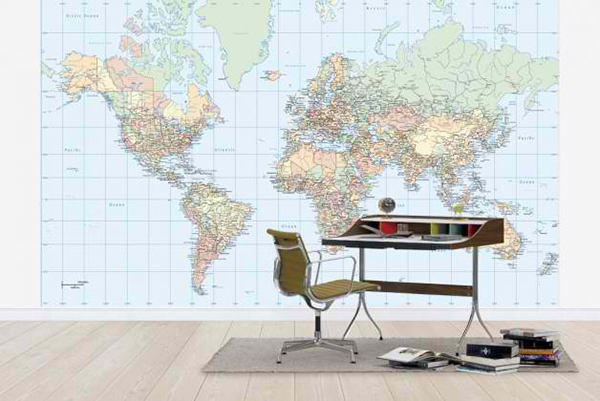 Bring nature to your home office with a bamboo wallpaper. Tone down with simple wallpaper like this one which seems to mimic sand’s texture. Overly chic and girly with a black, white and pink office! Those walls scream with appeal! 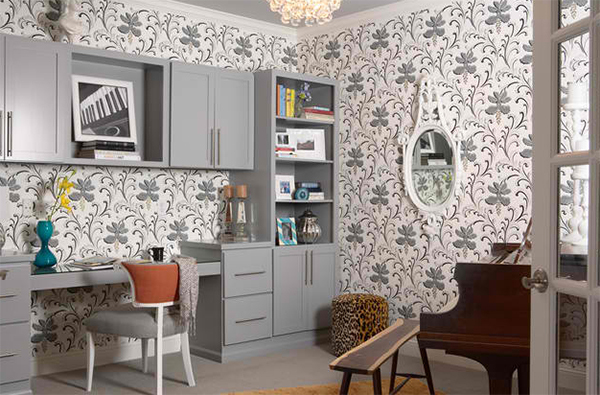 A modern home office that looks minimal in white and gray polka dots for the walls. Behold! The flowers and thorns have grown into the walls of this space that seemingly mimics the vines that crawled to a princess’ tower. How cute are these red scallops on the walls! This sure is a fun space to work in. A coastal themed space that will make you feel like floating on the ocean with the soft breeze. 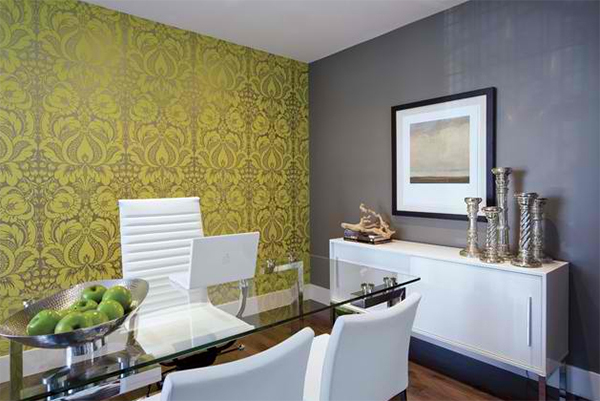 A fabric’s texture for a wallpaper can maintain that formal look in your home office while boosting its appeal. 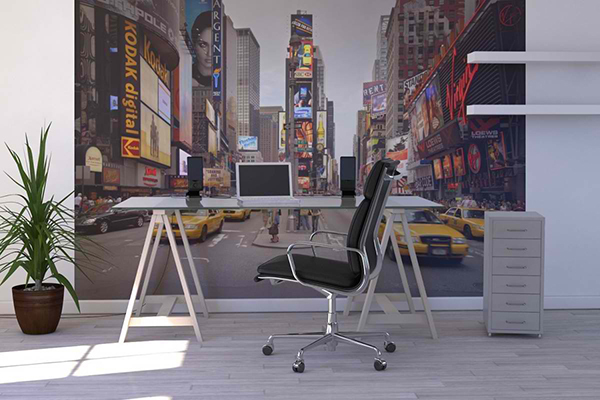 You’d feel like you are always with the city’s rush if you have a wallpaper like this one in your home office. You really don’t have to cover every wall with wallpaper just like what they did to this space. 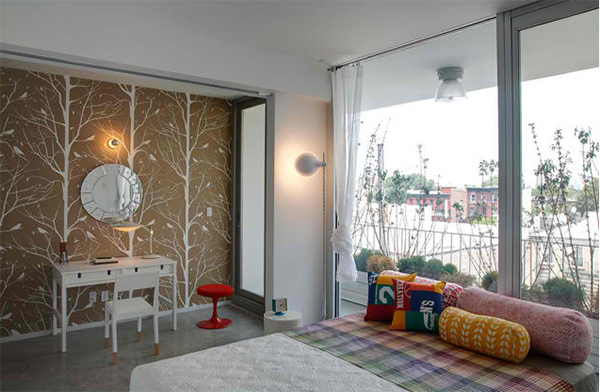 Look at how the space was enhanced with the simple wallpaper that complements with the details of the area. Branches cover the walls of this little working space which turned it into a stunning spot. Get inspired to work so you can travel around the world! This world map will surely get you going. 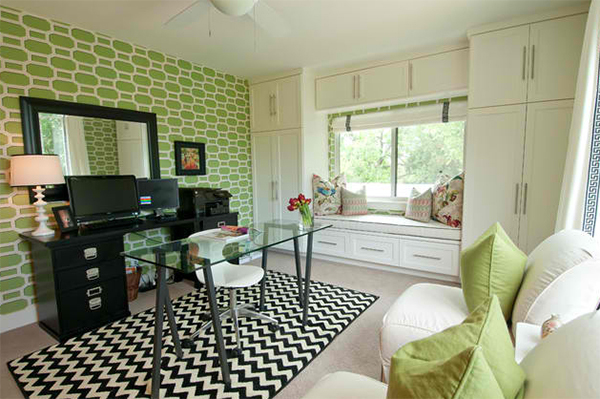 Geometric patterns in cute pastels cover the walls of this pretty home office and study. You can always go classic with a floral pattern in gray tones like this one. 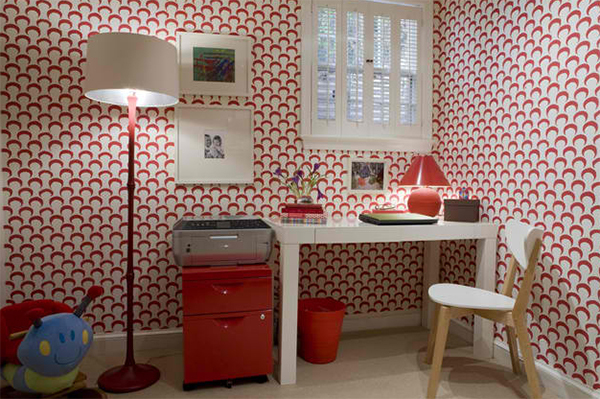 Adding a wallpaper to the home office can definitely increase its appeal. It could also affect the way you work. When you are in a well-designed space, you have that high spirits to work and you will feel motivate and inspired too. Speaking of being inspired, why don’t you get more inspiration from our list of cool home office ideas. Currently decorating your home office? 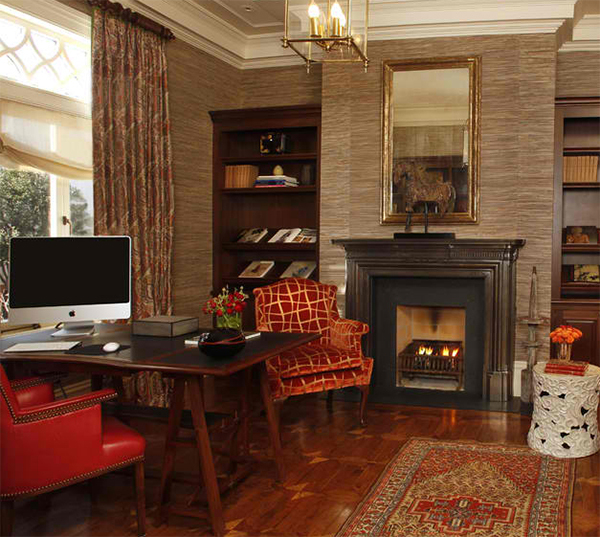 Head over for some tips on how to set up a better home office. You’ll surely have a blast with these helpful reads!